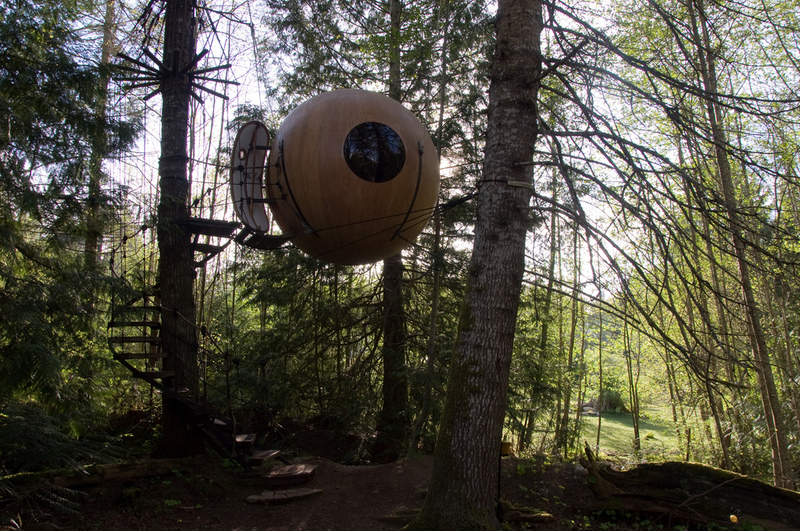 It’s safe to say we’re suckers for unusual spots to stay (just check out these places in the UK and Europe), but here’s one a little further afield: spherical treehouses on Vancouver Island. Climb the 14-odd feet of steps, enter the cunningly engineered curved door, and climb into one of the Free Spirit Spheres, which hang on webs of ropes that keep the four vessels off the ground. While the name gives away a barefoot mentality, you won’t be slumming it: the spheres are finished in cedar, spruce and brass, and they come wired for electricity, complete with built-in speakers. The area is in a coastal rainforest zone, allowing you to explore the gorgeous but temperate Canadian forests. But as the site comes complete with barbecuing facilities and even a sauna, you might not ever want to leave the grounds. If you really want to get away from it all, there’s even a one-person sphere, Eve, to stay in. And you needn’t worry about getting stuck in the middle of a family holiday spot: the minimum age for visitors is 16. While not the cheapest place to stay – rooms start at CAN$155 (about £90) a person – the prices drop very steeply if you stop for more nights. Get more information on the Free Spirit Spheres website, or watch the video below.